Let me start by saying, that Maggie Stiefvater is my favorite author. I love all of her books (though Shiver remains my favorite) and nothing makes me happier than when she announces a new book. And like always (and despite small short comings) The Dream Thieves did not disappoint! In The Raven Boys, Maggie Stiefvater conjured a number of subplots -- Ronan's dreams, Glendower, Adam's troubles, Gansey's impending demise. But it's only in The Dream Thieves that they start to weave together into a truly unified story... well, almost. It deals mostly with the subplots other than Glendower, with the promise that the Raven King will be the third and fourth book's focus. In the first book we got the object of the mission (finding Glendower) and who was the leader (Gansey). We also got the budding of an attraction between Adam and Blue, but the foreshadowing that Blue's real true love would be Gansey whom she saw herself lovingly kissing in a vision. And let's remember, Blue's true love will die when she kisses him. In The Dream Thieves we get a better perspective on some of the crew making up the expedition that Gansey is leading, specifically Ronan. While Gansey and Adam are still important figures, Ronan Lynch really is the main character of this story -- Maggie Stiefvater explores every part of his mind, from the flapping demons with razor-sharp beaks which he accidentally pulls out of his dreams to his fierce love for his mother and younger brother. Especially touching is his relationship with Gansey, which is finally defined and fully realized in a way that feels wholly organic. I love that Stiefvater incorporates this into her writing in such a subtle way instead of pointing it out again and again like other writers might, which reinforces that it is nothing unusual at all. There's not a lot of romantic movement with Blue, Adam and Gansey, though there are several important changes, which are somewhat unexpected, as one feels like one has missed a chapter or two (indeed Blue announces at the beginning that summer has passed since the ending of the last book). You still understand the story, but I felt like something was missing, especially knowing how perfectly Stiefvater can describe those tender moments of characters first falling in love. And keeping in mind the The Raven Cycle will now be four instead of the originally planned four books, one wonders why she chose to omit the summer. But The Dream Thieves features a cute little subplot about Maura dating the Gray Man. In fact, the Gray Man receives a surprising amount of development for a villain, with Stiefvater exploring how he thinks on a day-to-day basis, and what might inspire him to change. The biggest problem (villain) in this book is Kavinsky, a boy who also attends Aglionby and posses the same talent as Ronan -- while he provides a pretty epic twist, he's a thin, underdeveloped mass of devilish nastiness compared to the other characters. I would have liked a bit more motivation beyond, "I'm a selfish cruel psychopath." I think that the story would have benefitted if his thoughts had been explored like the Gray Man's, especially considering jealousy might have been his motivation. The Gray Man: has been hired by Professor Colin Greenmantle, for the last five years, to find the Greywaren which he believes is an instrument or relic that allows the owner to take objects out of dreams. We learn that Ronan can do this and suspect that he is the Greywaren that the Gray Man is looking for. While mysterious, he is as forthcoming as Noah was when he said, "I have been dead for seven years" and no one took him seriously. The Gray Man is asked his job and he truthfully declares, "I am a hit man" and apparently the truth is stranger than fiction because no one is phased by his words. For a bad man, you really want to like the Gray Man and find him suspiciously charming. It's like he half-heartedly struggles with deciding to be good himself, but never really puts any effort into it. At the end of the book it seems like he will continue to play a part in the story, though I fail to see how. Giving everything we know about him by them, it seems impossible that Stiefvater could keep him around as a love interest for Maura and otherwise there isn‘t a lot one could do with this character. Also, I really want to see him punished, as one good deed (helping Ronan) is not enough to make up for everything he has done. Ronan: Ronan can bring things back from his dreams and knows how his father made all his money because: "I am just like my father". Ronan feels that "All of his secrets felt dangerously close to the surface" and it turns out that he is right. We discover how important Ronan is to the search for Glendower as he discovers his abilities to bring things out of his dreams and what that means for Cabeswater. We really get to know and even like Ronan as we watch him make mistakes and remember to like himself. What surprised me, in a bad way, was his reaction to learning who killed his father and why. His reaction was not nearly strong enough given how much he loved his father and how much he was struggling after his death; I would have thought that Ronan‘s anger would have been inconsolable. In the story, it kind of gets brushed away in a we-have-more-important-problems-right-now-manner and I did not like it. Either the story should have been different (another character having done it) or it should have been revealed at a different time, so Ronan‘s emotions/ personality could have played itself out with full force. Adam: Made a deal to be the hands and feet of Cabeswater at the end of “The Raven Boys“. Now he is feeling the effects of his sacrifice which has got him all out of balance and even hallucinating. He has to discover how to deal and communicate with Cabeswater and finds that his relationship with all the group has changed drastically, but not as much as he has himself has changed. Also, he is battling the same anger management problem his father has, which is even worsed by his feelings of no longer belonging with the “normal“ people. And he finds it harder than ever to accept help (“pity“, as he sees it) from his friends, as he is determined to make it on his own, even without a clear definition as of what “it“ is supposed to be other than financial security. He comes to realize that he simply does not belong with the Aglionby boys due to his upbringing but more so because of his attitude, though he fails to see that different does not equal bad. 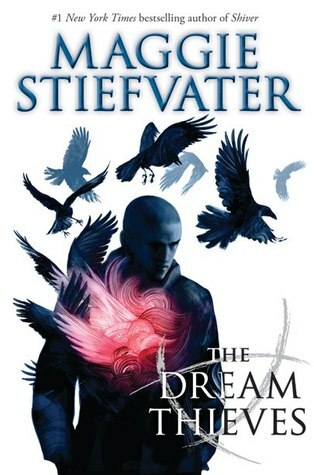 The Dream Thieves is a strong follow-up to The Raven Boys, exploring one of the more tormented characters of the series. And, as always, Maggie Stiefvater leaves you desperately hungry for the final chapter. I‘m especially looking forward to re-reading this book once the next one has been published and finally reading all four of them in one go, as I am sure that there are many small things hidden in between that you can only understand once the story has been concluded. Maggie Stiefvater has admitted to wanting to make her readers "feel" enough to cry and my instincts are that just like Noah and The Gray Man are being very direct about who they are, Maggie is not fooling around when she says that Gansey will die (and from Blue's kiss/ directly afterwards). Every bone in my body wants to rebel against her taking the story in this direction and I grasp at the fraudulent belief that she will "bring him back" somehow for a happily ever after, but I don't believe it in my soul. I believe I am on a journey that I have been told will end badly, but I have refused to take the warnings seriously and will have no excuse when the prophecy is fulfilled as defined. Nevertheless I can not wait to hold the next book in my hands!